Our correspondent finds the country taking a positive approach to the disappointment of their failed bid to stage the World Cup. WHATEVER claims may have been advanced this month on their behalf, or the development of the sport in Asia, Japan’s face is firmly to the future. 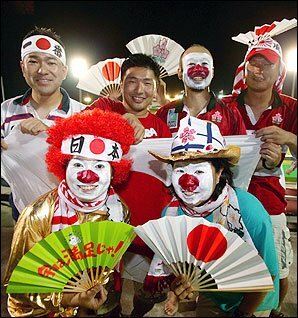 Having overcome their initial disappointment that their bid to stage the 2011 World Cup was unsuccessful last November, the Japanese union is intent on sustaining the positive image that surrounded their bid. There has been mild embarrassment over the spat involving the letter sent by the Asian Rugby Football Union (ARFU) to the IRB regarding the transparency of the bid process; also over the publicity attending Japan’s exchange of e-mails with Jamie Scott, the ARFU secretary, in the immediate aftermath of the voting that ended with the award of the tournament to New Zealand. At the same time, Japan have received encouragement to bid again, perhaps in 2015, when, if the usual rituals are preserved, the World Cup should return to the northern hemisphere. Whether that would bring them into conflict with England, one of their supporters in November, remains to be seen. The RFU bid unsuccessfully, with a radical new tournament structure, for the 2007 World Cup but has yet to decide whether it would return to the fray in three years’ time, when the tender process for 2015 is likely to begin. The RFU is, in any case, critical of the present methodology used by the IRB in determining the host union. “The award of hosting a RWC tournament under the current bidding system is not necessarily based upon organisational capabilities or financial strength,” its strategic plan published last year said. The RFU believes that that would offer a better long-term strategy for the global game and balance the need to maximise World Cup revenues against the need to stage a World Cup in a developing country such as Japan or the United States. Under such a system, the IRB could have awarded the 2011 tournament to New Zealand and told Japan, at the same time, to prepare for 2015. As it is, Japan have decided that, having achieved such an administrative presence on the world stage last year, they must improve their playing strength as a matter of urgency. To that end, Japan are not only eagerly awaiting the inaugural Pacific competition, to be played in June and July, but are making overtures to other tier-two countries. The new competition, involving the Junior All Blacks, Fiji, Samoa and Tonga, as well as Japan, takes the place for an initial three years of the Super Cup, of which Japan are the holders. It seems certain, therefore, that Japan will be talking to those countries who were involved in the Super Cup (Canada, the United States and Romania), as well as the likes of Spain, who visited Tokyo in November, and Portugal, accepting the possibility that there would be financial implications in inviting other countries to play regular international matches. I have asked the IRB to assist in the scheduling of Southern Spears home and away games against Japan, Germany, USA Eagles, Kenya, Madagascar and Namibia to up skill the Spears players, move them through the lower tanks of the Tier 2 countries and then to build bilateral trade and sporting relationships with these countries. Naturally this profiles the sponsors int hese countries.